Strange title, I know. The title was the toughest part of writing this blog post to be honest. 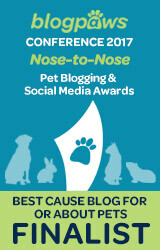 I am participating in the Be The Change 4 Animals blog event. 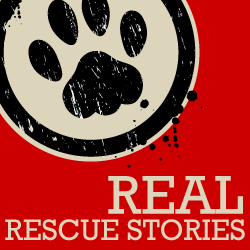 I want to use this special blog post to share with all my readers the degree of commitment my Mom L and Dad P have to being the change for animals. When Mom L first learned that Dad P had two cats, Squeaky and Barney, as a single guy in his early 30’s—she thought he was someone she would like to know better. And when they married, Dad P made sure Mom L had her very own kitty. All three cats were rescues in one way or another. And their commitment to making the lives of companion animals better has bonded them for thirty nine years. Mom L always wanted another gray kitty so Dad P heard about a kitten and brought her home. Dad P’s other cat, Barney, took the kitten under his paw and the kitten worshiped Barney. Mom L named her Ixtaccihuatl. I know, I know—hard to wrap your tongue around that name, right? Ixtaccihuatl, in Nahuatl, means “white woman” and it is the name of a dormant volcano above Mexico City. It is also called Mujer Dormida meaning sleeping woman. Mom L somehow thought that was the perfect name for her kitten. Thankfully for that kitten, they called her Ixy. Now what does all this have to do with Be The Change 4 Animals you might be wondering. Well, I wanna let you all know that thirty nine years later, my human guardians are still helping cats have the best life possible. I have shared more than once the SNIP (spay,neuter impact program) clinic where they both now volunteer. SNIP is held only four times a year and the April clinic this month fell smack dab on their thirty ninth wedding anniversary—April 10th. And what did they do to celebrate their thirty nine years together? You got it, they Pawed It Forward, and worked the SNIP clinic to celebrate their special day. They and all the other volunteers who staff this special clinic were the change for 71 community cats that day. Many of those cats were pregnant and are returned to their trap location, without having to ever have kittens again. And those males with big jowls and fight scars will hopefully never feel they need to protect their territory again. Here are some photos of Mom and Dad’s thirty ninth wedding anniversary celebration. 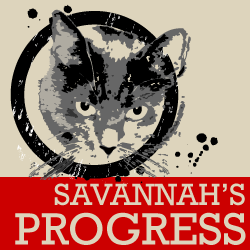 And yes, the above photo of the man wearing a Savannah’s Paw Tracks t-shirt is my Dad P! *proud ears* Here is the lucky kitty who arrived first. He was really nervous, but because he is young, he will not have to face years of fighting other un-neutered male cats for turf. Dad P transported him in his trap to await his surgery. TNR WORKS!! Next is waiting for surgery—the hall before patients arrive and after they come flooding in. From the waiting hall, they go to sedation, then weigh in and first quick medical check for obvious wounds, pregnancy, etc. From here they are hand carried (Mom L got to help do weigh in and hand carry!!) to the surgery prep area for shaving and ear tipping. Surgery prep is quiet and then it is NOT!! Now they are in to surgery. After surgery they receive vaccinations, flea and ear mite treatment. The table and supplies are ready and then it begins! The photo above of the kitties getting their vaccinations is blurred on purpose. They deserve some privacy, don’t you think? And then they are reunited with their own personal trap and whisked off to recovery where it is warm and quiet. Have a look at some of the patients up close and personal. They are not always in the best of body condition, often matted fur and dirty, but they go back home as cleaned up as they can be. Mom L just adored this cat. She glanced down as she was tagging his trap and saw two sweet paws gripping the trap for dear life! Isn’t he just precious! So hard to believe that they can’t all be scooped up and taken home for a cuddle. But because of SNIP and all the volunteers, including the couple who used SNIP as their celebration event for their thirty ninth wedding anniversary, this cat will have a better chance at living a longer and more healthy life as a community cat. 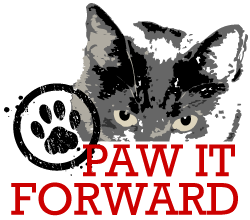 What do you do to Paw It Forward and Be The Change 4 Animals? Happy anniversary to your awesome Mom and Dad! We’re so proud to call you friends, and to be partners in helping animals! Happy anniversary!! Sounds like a purrfect way to spend it too! 🙂 Thank you for your 39 years of helping cats and thank you for joining in Blog The Change For Animals! What a wonderful and inspiring post!! Thank you for sharing – you sure do wrap your paws around the concept of Blog Change for Animals! Happy Anniversary to your parents and you and TKS are fortunate to the extreme. What a great post! Happy Anniversary to your amazing mom and dad! What great stuff to read about! What your peeps did then, what they do now and what they’ve been doing for thirty-nine years. HAPPY ANNIVERSARY! May they enjoy many, many more. Purrs, Seville. What a wonderful way to celebrate your 39th wedding anniversary with volunteering on a cause that you both feel strongly about. Happy anniversary!!! Happy 39th Anniversary to 2 amazing people. That was such a wonderful way to celebrate by helping more cats. what a wonderful story – and the PURRfect way to celebrate 39 wonderful years! I spent a day helping a spay clinic, and it was such a rewarding thing. I always love hearing about others doing it as well. Happy 39th Anniversary to your Mom and Dad. My peeps have 5 years on them. We’re so proud of all the great things they do!!! Paws up to your peeps, Savvy for spending their special day helping the animals! Happy Anniversary to your parents! What a cool way to spend their special day. You should be proud, Savvy. Happy 39th Anniversary! I love that you spent it volunteering with SNIP! That’s truly amazing. My husband also loves cats and on an early date, he met my cats and they gave their approval of him and well, the rest is history! What a wonderful story of love! Especially love the way you celebrated your anniversary. Fantastic! Thanks for blogging the change for animals. I love how so many of this clinics work to help keep the cat population down. I read of a community (I can’t remember which one) where the mayor wanted the trapped animals euthanized and not released. Clearly he did not understand the program! 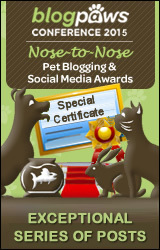 Thank you for being the change for animals and for supporting the blog hop. that is a GREAT way to paw it forward!! GREAT post! Happy Anniversary to your peeps! TW was a tears looking at that little guy hugging the bars. I’d love to use that pic next time I do a piece on shelters and TNR. Thank Mom L and Dad P for all they do even with everything else on their plates. BTW, I’m hooking you up with the blog hop so others can read this inspiring story. oh thank you CK. we forgot to hook up! I will send you all the photos of the sweet kitty hanging onto his trap. He never let go until he got to sedation. Oh that one hugging the bars is just gorgeous! Question, what happens if you find the cat is pregnant? A late Happy Anniversary to you both and hope you will have some time together. This is so wonderful and SNIP is quite the operation! It’s people like Mom L and Dad P who make the world go round for kitties. How wonderful that they celebrated 39 years together by helping cats. That’s the perfect way to spend an anniversary. Congratulations! that was a wonderful plan for your humans anniversary Savvy… I wish this world would have more peeps like Mom L. and Dad P. then it could be a warm and friendly place…. Happy Anniversary to your pawrents and hugs for being super pawsome! Happy anniversary L&P! What a great way to celebrate that milestone. We have another new cat who turned up uninvited. Pippin is around 2 and the most gorgeous fellow. The vet agrees with us that he was a house cat that has been fending for himself for a very long time. Snipped, chipped and treated for all and sundry and beginning to settle in well. The only issue being getting to cope with our two dogs. He’ll get there! OMC, Savvy, your humans are so AWESOME and such great examples for other humans to follow! You should be totally proud of them, for all the work they do. It’s one thing to have a great heart… it’s another to use that as motivation to do good work. Happy anniversary (even if belated) – the next will be a big number then! They call it ruby-anniversary. Great story, Linda. What a lovely couple you were on your wedding day. Congratulations on your 39th. Here’s wishing you many more. Your pictures were so informative. And what an observer you are to snap that one of “hanging on for dear life”. How true, how true. We all find ourselves in situations where we know how it feels to “hang on for dear life”. 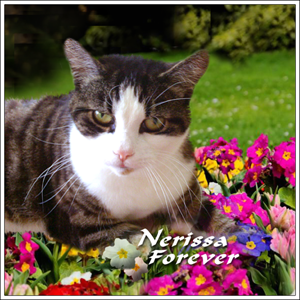 Thank you for all your work on behalf of all kitties. Happy Anniversary to two fine people I am proud to know. Mom L. and Dad P. Thank you for an inspiring report on TNR! !